idli with cooked rice - the steamed rice makes these idlis ultra soft, fluffy and very light. soak the urad dal atleast for 3-4 hours or more. soak the idli rava for 2 hours. drain the urad dal and reserve some of its strained water. we will use this water to grind the idli batter. drain the idli rava very well. add the drained idli rava, urad dal and cooked rice in your wet grinder or the grinder jar. first add 2-3 tbsp water and begin to grind. stop grinding, and then add the remaining 6-7 tbsp during intervals. the batter should be fluffy, smooth and ground well. pour the entire batter in a deep pan or bowl. stir in salt. cover with a lid and let the idli batter ferment overnight or for 8-9 hours. the next day before making the idlis, add 2 to 3 cups water in a steamer or electric cooker or pressure cooker. switch on the steamer or electric cooker or place the pressure cooker on the fire and let the water come to a boil. place the idli pan in the steamer, electric cooker or pressure cooker. cover with their respective lids. if using pressure cooker, remove the vent weight (whistle) from the lid. steam for 10-12 minutes or more till a tooth pic inserted in the idlis comes out clean. 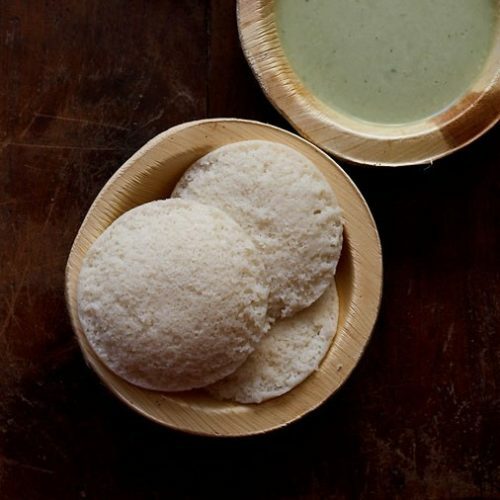 serve the cooked rice idlis steaming hot or warm with some coconut chutney or sambar or both.